Don’t you just love how some people can make the most delicious recipes with minimal ingredients? That’s certainly what our contributor Ilona from Ilona’s Passion has done this week. This loaded sweet potato not only looks amazing, but it’s incredibly easy to whip up! 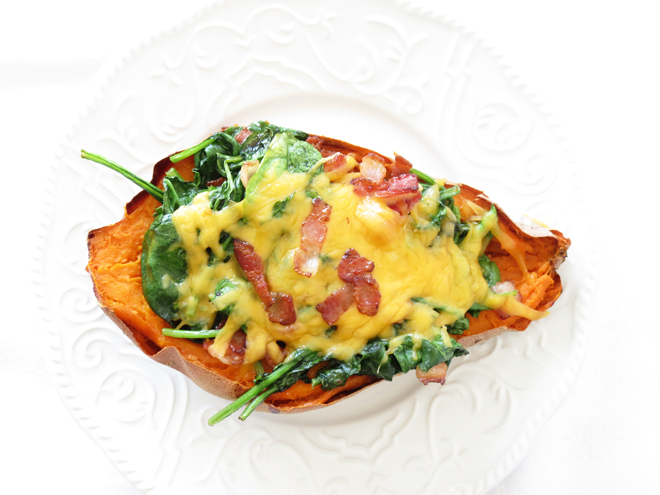 Loaded sweet potato with spinach, bacon and cheese is the best dinner that I’ve had recently. I’m not a sweet potato person. I don’t eat them often. And I buy them rarely. However, after reading many recipes with sweet potato I’ve decided to give a second chance to this vegetable. I have so much spinach at my home all the time and I thought that sweet potato plus spinach would taste perfect. I was definitely right. I added some bacon and cheese. The whole loaded sweet potato tasted amazing. I couldn’t stop eating. At first I baked sweet potato in the oven by itself. Then I saute some spinach with bacon on the pan. And I loaded my sweet potato with yummy ingredients and baked again. The whole process was so easy and the outcome was incredible. I’m very passionate about potatoes and I hope that you found my other delicious recipe Basil Roasted Red Potatoes. A couple of simple ingredients and an amazing dish can be made. After my loaded sweet potato I know that I will buy them more often and they will be seen a lot on my plate during dinner time. There are many simple and tasty sweet potato recipes on the internet. I’m so happy that I can browse and decide what else can I do with this vegetable. I have so many ideas in my head right now. 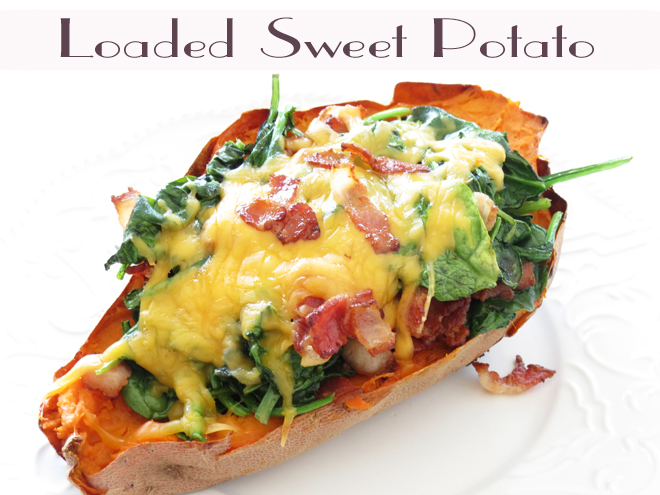 In the meantime enjoy loaded sweet potato with spinach, bacon and cheddar cheese. I can tell it’s very good. Preheat oven to 450 F. Prepare baking pan with foil. Wash sweet potato and poke with fork. Place on baking sheet and bake 25 - 40 minutes. It depends how big is your sweet potato. Just check with fork if it's soft and baked through. Cut bacon into small pieces, place on the pan. Cook them for awhile. Remove excess oil from the bacon. Add spinach, season with salt and pepper. Cook for 2 - 3 minutes. 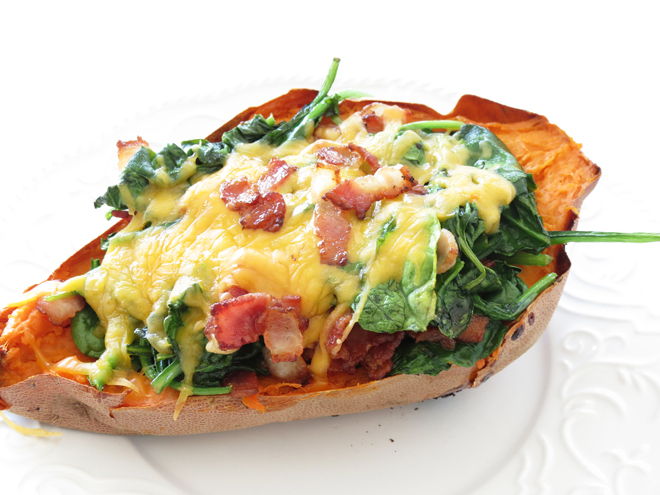 Cut sweet potato in half, add spinach with bacon and shredded cheese. Do you like sweet potato or do you prefer other type of potato? It might just be the time to start eating sweet potatoes then Marina….lol 🙂 Thanks for pinning. It’s really appreciated! Thank you for sharing this, I can’t wait to try it! That looks great! I love sweet potatoes. I’m going to the store to grab a few and give this a try. Thanks for sharing on Taste Tuesday! Hello Catherine, thanks for sharing on #wednesdayswisdom, I just love sweet potato and yours looks so good. Thanks Jennifer. Ilona certainly made our mouth water with this recipe! What a great idea! I make stuffed spuds all the time but had never thought of using sweet potato for something like this! I was given some home grown white sweet potato over the weekend so will try a version of this during the week. Stopping by from Merry Monday over at Pinterventures. You know what, I’ve never even THOUGHT to load a SWEET potato! Brilliant! Thanks so much for taking the time to link up with us over at the #HomeMattersParty – we hope to see you again on Friday! Looks like now might be a great time to start Kristen 🙂 Hope you enjoy! This sounds delicious! Thanks for sharing on Sunday’s Best. I will be pinning this.